A large number, maybe even the majority of us are managing unhappiness from day to day. We have hope that the script will flip and we’ll break through to something more satisfying, but the wheel turns again and we find ourselves in the same old cage as before. By god, we want to be happy, but there are just so many things that seem to get in the way. If we understood the cause of our unhappiness, perhaps we could snap out of it. Our tendency is to blame things and other people outside ourselves for how we feel. Our circumstances are the reason we’re stuck; that’s why we’re unhappy. Which of course means that our hope for happiness awaits a better job, a different spouse, a new set of circumstances. If the problem is outside of us, the solution must be as well … or so we tend to believe. But it isn’t outside of us, neither the problem nor the solution. Understanding our unhappiness and why we spend all this time and energy trying to manage it is the only way through. Otherwise all we’re left with is hanging curtains in our prison cell to make it seem more like home. The question we need to ask is how we got into this cage in the first place. Logically if we reverse our steps and unwind the script that landed us here, we should be able to make some different choices. Let me start this process by distinguishing between what I’ll name primary concerns and ultimate concerns. Primary concerns arrived at our door even before we had the capacity to reflect on them. In fact, the deepest of these primary concerns pokes our nervous system far below conscious thought, at the very roots of self-consciousness. Security is our sense of being supported in a reality that is safe and provident. As this spontaneous feeling depends to a great extent on the nurturing love and attention we received as newborns, our sense of security – and of reality at large – is a function of having caring and able parents. But you know what? No parent is perfect, and every family system has endemic dysfunctions with histories trailing back into ancestral generations. Our mother couldn’t be present every time a pang, ache, or startle announced itself. Our father didn’t always respond with the motherly compassion we were expecting. As a result, insecurity gained a foothold in our nervous system – just a toe perhaps, or some greater degree of magnitude. But there it was. Maybe reality wasn’t so safe and provident after all. The thing that makes a sense of security problematic, of course, is the fact that reality is not all that secure. Accidents do happen. Normal processes stray into abnormalities. We don’t get what we need right when we need it. Sometimes we just don’t get what we need, period. When this misalignment between our needs and reality occurs at a level where we are most dependent on what’s outside ourselves, the insecurity can be overwhelming and debilitating. When we feel sufficiently secure – not perfectly, but sufficiently – we are enabled to begin taking control in our life where necessary and appropriate. Gradually we find our center and begin relying less on our taller powers and other props. We learn how to control our sphincters, our movement, our fingers, our tongue, our temper, our thoughts, and our actions. This primary concern of control is essential to our sense of integrity: of how well our identity and our life hold together, persisting through time and across circumstances as a unified system. But when we are insecure, this natural progress toward control gets complicated. The feeling that we are not safe and that reality is not provident may compel us to grab on for relief to whatever is nearby. Or we might insist on clinging to our supports longer so we can continue borrowing on the stability they provide. In either case, our insistence on control (but not in the healthy sense) locks us up inside a web of neurotic attachments, with an unrealistic expectation and impossible demand that they deliver on our need to feel secure. 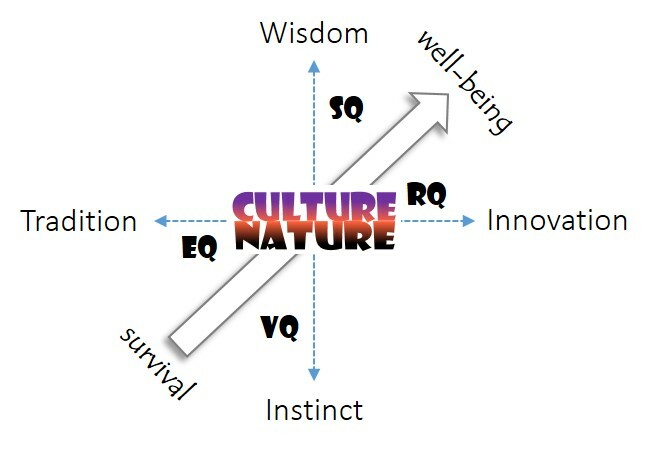 That’s what the cage represents in my diagram above. In this condition, freedom, the third of our primary concerns, is simply not possible. Besides, the very idea of freedom provokes anxiety in us since it would mean being without all these safety strings attached. The prospect of living outside the cage is terrifying when we’re convinced that reality is a dangerous and unpredictable place. The short dotted arrow extending vertically from primary concerns to ultimate concerns indicates that while the process of development would normally cross this threshold, many of us choose to stay inside the bars. True enough, we probably don’t see this as a choice we’re making but simply as the way things are. We are just making our way as best we can, except that this ‘way’ is going nowhere. Time’s circle finds us in the same state of mind as the day before, as the year before. And even if we manage to exchange one disappointing relationship for another, the same neurotic insecurity soon enough makes it just another prison. Before we leave this tragic condition, I should make the point that all our chronic troubles as a species can be traced to this preoccupation with managing unhappiness. All of them. It’s even likely that a majority of our medical ailments and diseases are psychosomatic – not merely comorbid with our neurotic insecurity, but caused by it. Think of all the economic, political, and religious strife over the millenniums with its cost in terms of hopes trashed, lives lost, futures foreclosed. All because we are convicts of our own convictions, hostages to ideologies we have ourselves created in the expectation that maybe this, maybe that will bring us what we presently lack. A few have found liberation, though not from the insecurity of existence. They realize that life is not perfectly secure, and neither is their longevity or individual prosperity guaranteed. Their key realization, however, has to do with the difference between the inherent insecurity of our situation and the open option of allowing that fact to shake our nerves to shreds. There is always the option (which is why it is qualified as ‘open’) of releasing the anxiety, recovering our center, taking control where we need to, and choosing another way. Not a different partner or profession, but something that ultimately matters. Only when freedom is embraced and not abandoned for the false security of a cage, are we able to direct our creativity and devotion beyond the management of unhappiness. The first of our ultimate concerns is purpose, which refers not to someone else’s agenda for us – even a patron deity of religion – but to our own commitment to live intentionally. When we live ‘on purpose’ we are more aware of where we are, not just our physical location but more importantly where we are in the moving stream of our life. Opportunity reveals itself only to the one who is paying attention, who is purposefully engaged. Perhaps the most important engagement of a life lived on purpose is with the construction of meaning. 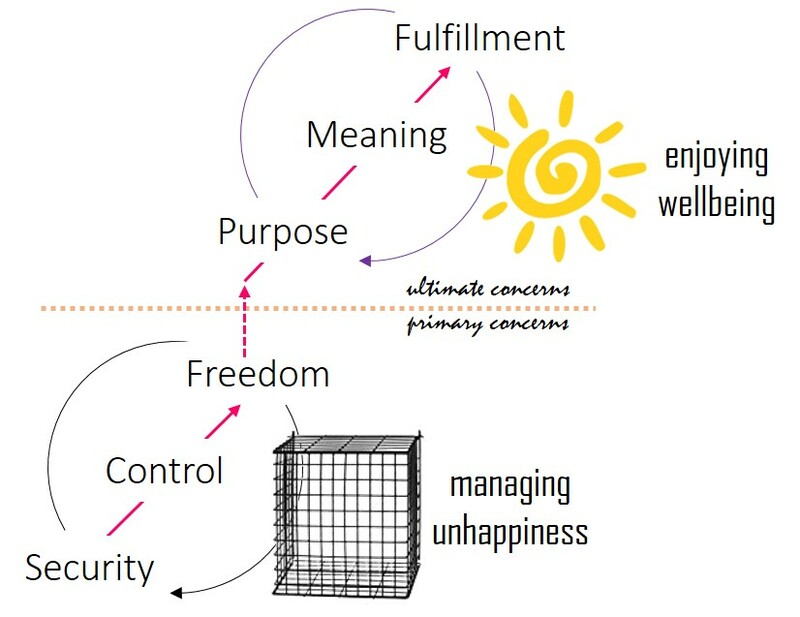 Whereas the millions who are managing unhappiness believe that life is meaningful or meaningless as a matter of fact, those living on purpose understand that life just is what it is, and that its meaning is up for us to decide. In this respect meaning is a function of the value, identity, and significance we link to things, to other people, and to the events of life. This entire system of linkages constitutes what we call our world. Worlds are human constructions, and each of us is responsible for our own. Meaning isn’t only an individual affair, however, since our personal worlds are nested inside larger tribal and cultural worlds. The overlaps and intersections are places where we find agreements, differences, misunderstandings, or conflicts, as the case may be. Obviously – or I should say, what is obvious to the person who is living on purpose and taking responsibility for the meaning of his or her life – whether this greater scene is a marketplace, a wilderness, or a battlefield depends a lot on our guiding principle of truth. Is there an absolute and final meaning of life? Many who are managing unhappiness inside their prisons believe so. Indeed they must so believe because life is only bearable if there is a meaning beyond question – an infallible, absolute, fixed and transcendent meaning that makes our searching, fighting, dying, and killing for its sake worthwhile. Or maybe meaning is never final. Maybe our world construction project will never be finished. Maybe it’s not just about how reality-oriented (i.e., factual and evidence-based) our world is, but also how effectively it facilitates our fulfillment as individuals. By this I don’t mean just another synonym for feeling happy. To be ‘filled full’ is about reaching our capacity, realizing our full potential, filling out into a fully self-actualized human being. Because meaning and world are anchored to us as persons, fulfillment is necessarily apocalyptic: we see that our world is not the last word, that there is life (authentic life) on the other side of meaning, and that this larger experience is profoundly transpersonal – bigger than us, beyond us, including us but not revolving around us as we once believed. Our quality of life at this level can be described as enjoying wellbeing, where being well and being whole inspire a deep joy in being alive. This doesn’t mean that things always go our way or that we always get what we want. Existence is still inherently insecure and nobody’s perfect. But we have released our demand that it be otherwise. Happiness will come and go. Our circumstances and life conditions will inevitably change. Only now we can let it be. In time, more of us will leave our prisons where we manage unhappiness from day to day, to take responsibility for our lives, stepping mindfully and with gratitude into each moment we are given. I’ve written before on what I call the Matrix of Meaning, referring to a deep code of primary concerns and narrative motifs that generates the very fabric of our worldview. A sense of self and reality is the central construct in our personal myth, orienting us on the pressing challenges and emerging opportunities in our journey through life. The Matrix is deceptively simple in design, but the patterns of meaning it can produce are beyond number. Your life story and personal worldview are very different from mine, but the same Matrix of concerns and motifs is behind them both. My first-time reader needs to know that I am a constructivist and employ the term ‘myth’ in its more technical (rather than popular) sense, as a narrative plot that holds the body of a story together and drives its action. Although we may have authorial liberties regarding the style and idiosyncratic features of our personal myth, the deeper structure is determined by what the ancient Greeks personified in the goddess Ananke, or Necessity. In other words, how you respond to adversity, hardship, pain and loss is unique to you as an individual, but the inevitability of suffering is universal for human beings. This was the Buddha’s First Noble Truth. My diagram depicts the Four Ages of individual development, and these, too, are universal archetypes in mythology: the Child, the Youth, the Adult, and the Elder. I’ve indicated the average years over a lifetime when we transition from one to the next, but these shouldn’t be taken as hard predictors. The developmental challenge of a given Age might not be successfully negotiated, in which case our neurotic hangups around its primary concern will be carried into the next challenge, compounding our difficulty in making it through. Indeed, the fact that none of us gets out of childhood without some insecurity throws light on the question of why the human journey can be so damned complicated. Northup Frye’s four literary types are also included in my diagram, each one corresponding to an Age and its driving concern. Comedy is the up-swing to ‘happily ever after’. Romance follows the heroic quest for an ideal. Tragedy descends the plunge-line of misfortune. Irony provides a double-vision between what is said at the surface and what is meant underneath. Our personal myth will predictably move through these distinct narrative frames, forcing us to adapt our construction of meaning to the shifting focus of our life in time. Although many have tried, any attempt to impose a frame of comedy over the reality of suffering only ends up forfeiting a potentially life-changing insight behind a veil of denial and make-believe. Needless to say, otherworldly religion is especially good at this. 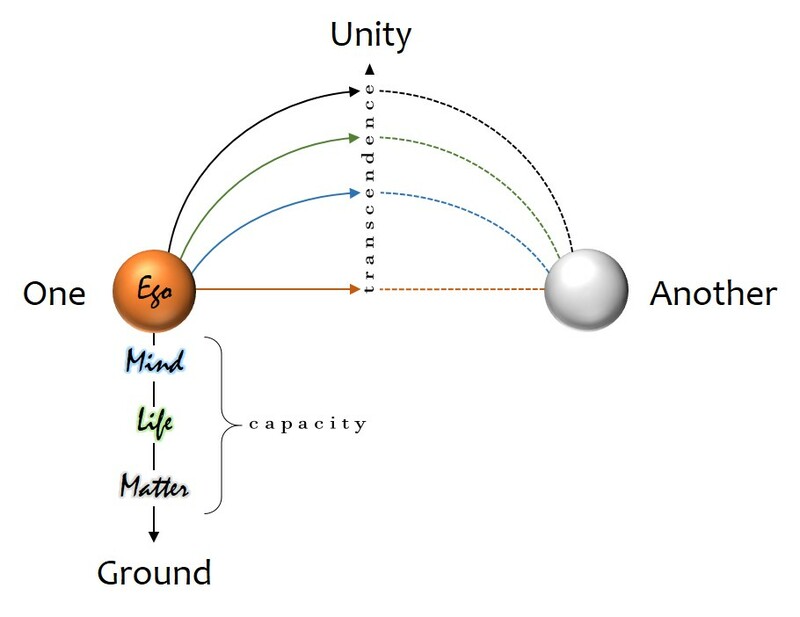 The multicolored arc across my diagram represents the progression of consciousness through an ‘animistic’ body-centered stage (color-coded black), through a ‘theistic’ ego-centered stage (orange), and farther into a ‘post-theistic’ soul-centered mode of life (purple). 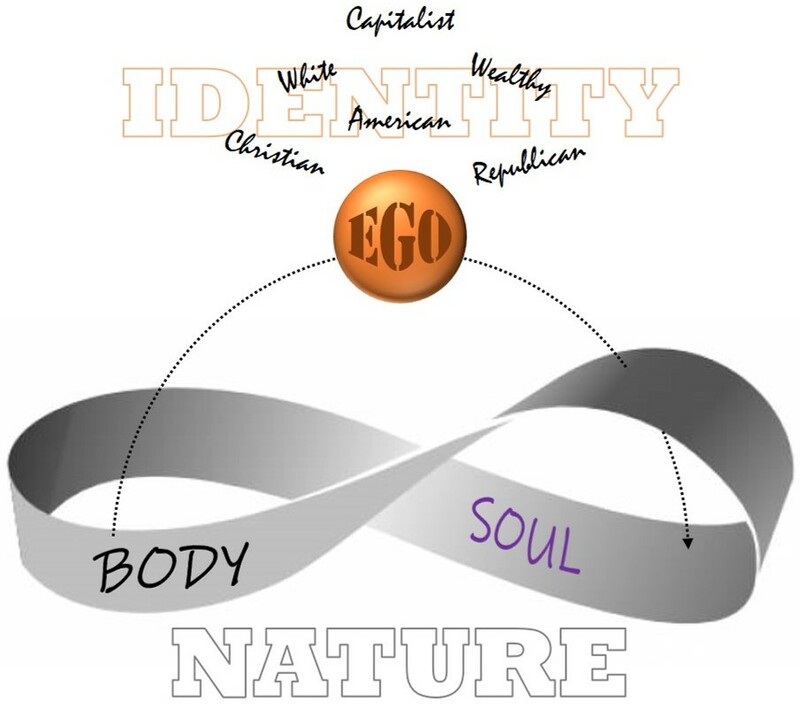 Only a small minority are willing, or even able, to release personal identity (ego) for a deeper mystical realization and larger ethical vision. The rest of us fall in line with the status quo, take refuge inside our convictions, and succumb to the consensus trance. This is when theism can become pathological and our god starts looking like a glorified version of ourselves – a moody, judgmental, and self-righteous bigot. My purpose in touring through the diagram in such detail is to lift into view the paradoxes in play throughout. The security of early childhood is in polar tension with the suffering that comes on as we mature. Much of suffering has to do with the loss of attachments that anchor identity and meaning for us, but which also represent for us a reality that is safe and supportive. Security and suffering, as primary concerns coded into the Matrix of Meaning, are paradoxically related. It’s not security or suffering, but the tension between security and suffering that drives our construction of meaning. Similarly, freedom and fate are polar opposites, making the interplay of our control in life and the conditions outside our control a second creative opposition. Freedom and fate only seem to exclude each other, while real wisdom involves learning to live inside and with their polarity. This consideration of the paradoxes inherent to the Matrix of Meaning, and how these concerns compel us to make meaning that is at once relevant to our situation in life and capable of orienting us successfully throughout our journey, brings me to what I’ll call the supreme paradox. I refer my reader back to the diagram, specifically to that arrow arcing across from left to right. 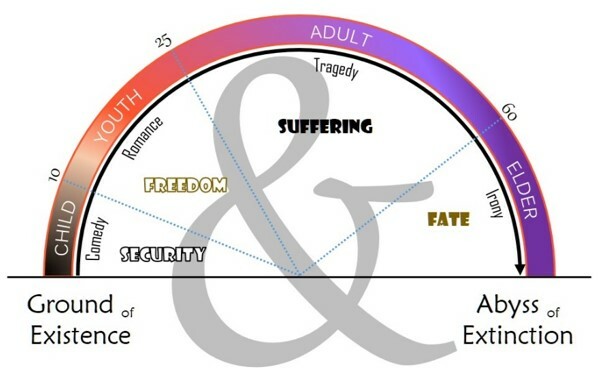 This represents the arc of our lifespan, tracking through the Four Ages (if we live long enough) from birth to death. Especially during the first half of life, and most critically in those early years, we experience the uplifting support of reality in our growing body, a nurturing family system, and a wide world of opportunity. Such a conspiracy of virtuous forces instills in us a deep assurance of reality as the ground of our existence. We are the living manifestations of a 14 billion year-old process, a flower of consciousness emerged from this magnificent universe, the cosmos contemplating itself in wonder. Surely this is the root inspiration of true religion: the ineffable sense of being sustained by a provident reality, coming to be and living our days under the watchful intention of a mystery we cannot fully comprehend. All the mythological gods who provide us with nourishment, protection, guidance, and solace are metaphorical personifications of this provident ground of existence. There are other gods as well, who begin peeking in as our exposure to reality becomes more complicated and challenging. These are dark forces – tricksters, shadowy forms, and unseen solvents that slowly erode the foundations of our neat and tidy worlds. Yes, reality is the provident ground of existence, but it is also the inescapable abyss of extinction. Coming-to-be and passing-away are the paradoxical reality of our life in time. We may want only a reality that supports and promotes our rise into identity, safekeeping our existence forever and ever, but that’s not how it is. As Carl Jung pointed out many times and Lao Tzu made the central insight of his reflections on the way (Tao), light and dark are not absolutely exclusive of each other. Rather, they swirl together, pulling and pushing, blending and separating in the dance of reality, generating the ten thousand things and dissolving them simultaneously into the ineffable secret of the Tao which cannot be named.